As an Optional extra we can upgrade your outdoor building's roof covering from standard Green Mineral felt to 'Onduline' Roofing Sheets. 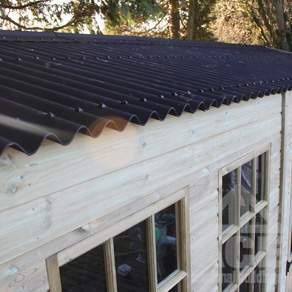 Available in 3 different colours (Black, Green & Red) this product is an extremely tough lightweight corragated roofing material which carries an Insurance backed 15 year waterproof guarantee. All Onduline roofing comes complete with an O.S.B roof in the case of a spray treated building and a Tongue and Grove roof in the case of a 100% Pressure Treated Building. This provides an extremely tough and durable layer for Onduline to be fixed.